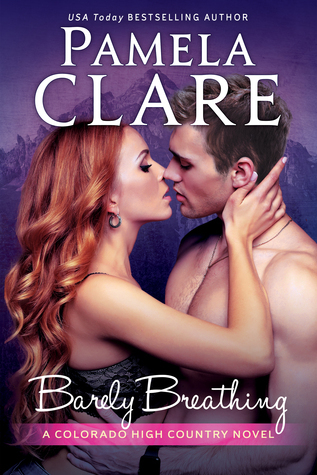 Barely Breathing is a great start to a whole new series by Pamela Clare. It is related to her I-Team series, and while it looks like you don't necessarily have to have read her I-Team series to enjoy this book, there are two distinct I-Team characters who cameo in Barely Breathing. You don't really need to be familiar with them, but I'm always tickled at seeing old favorites show up in a new series' setting. Lexi Jewell left Scarlet Springs twelve years ago to pursue a new life away from an unsatisfying and sad childhood. Twelve years later, after a falling out with the accounting firm she'd thought was her ideal career, she's returning to Scarlet Springs for a short reprieve before setting off to start a new chapter in her life back in Chicago. Coming back to Scarlet Springs is more than just a relaxing vacation for Lexi though, having taken on the task of trying to help her father get his own life back together and win back his wife. And then there's Austin Taylor, her high school sweetheart and first love. The two had broken up on a bad note, breaking each other's hearts and allowing that hurt to fester all these years. But even if Austin is still smarting from that break-up, Lexi is determined to move on remain polite, friendly, and civil. In turn, Austin knows he can't continue to hold a grudge with this girl whom he's always cared about. Meanwhile, several events, side jobs, and even the people in town seem to be keeping Lexi in Scarlet Springs, no matter how determined she is to leave again. Except it seems that Lexi is not as eager to leave as she had thought she'd be--at least not when Austin is back in her life once again and life feels more comforting and "at home" for the first time in her life. I'm completely biased towards Pamela Clare, but it helps that her books are typically written well, with great attention to detail, and wonderfully created characters to match. I also love the aspect of following a team of search and rescue workers, and while the story of Barely Breathing was quite mundane in it's day-by-day telling of how the SAR team works, I really enjoyed seeing how each incident was handled, "listening in" along with Lexi as she sits there and hears the random bits of radio communication in the SAR team's headquarters, The Cave. The realistic handling of it all makes you so much more interested in seeing how SAR functions on a regular basis, and what other stories are in store for us to come. Lexi and Austin are great together, and as a second chance romance, I thought their relationship was developed quite well. Pamela Clare romances often tend to get too overly sentimental and schmaltzy, but Barely Breathing did not do that--I'm quite happy with the way the love story was handled. The slow, natural introductions of all other characters in the book create a nice anticipation of what's to come in this series. Who's going to be the next main character? Are we going to get a story out of each and every member of the SAR team? And then there are others as well, not of the SAR team: (1) Rain, the bar waitress at Knockers who is a single mother and now also works for Lexi's father as housekeeper of his Bed and Breakfast; (2) Victoria, Lexi's best friend from Chicago who was the only friend who didn't turn her back on Lexi with there was a falling out with everyone else, and who now faces living alone in Chicago without her best friend; (3) Britta, Lexi's sister who lives in California... we don't get much other background about her current life, but I'm kind of interested to see what might come from her story. I'm already revved up to read the next book in this series and it hasn't even been announced yet! This is how excited I am after reading Barely Breathing! Aside from the second chance romance, Barely Breathing also touches on some aspects of Lexi's life: facing a lifetime of sadness and hurt from her father and stepmother upon returning to Scarlet Springs, trying to figure out what she wants to do with her life now that she's out of a job, rediscovering what she'd left behind in Scarlet Springs and falling in love with a town she had always thought she hated. While the resolution felt a bit simple and convenient, I'm really not complaining all that much--we get a Happily Ever After™, and Lexi seemed genuinely happy to be rediscovering a love for Scarlet Springs and its people, and genuinely happy to have found somewhere where she feels at home. Barely Breathing was great fun. Aside from the questionable choice for book cover (wth? ), I'm not sure I really found anything about this book that bugged me. Maybe I thought that the conflict between Lexi and her father and her stepmother, Kendra could have been handled a little bit better. Maybe I'd liked to have seen Lexi demand some apologies from them for how they've been treating her since her return to Scarlet Springs. But I suppose that's an open-ended work in progress, and since many other things worked out in Lexi's favor, I'm content enough to not let it bother me. Colorado is one of my favorite states to visit for a relaxing vacation, and a book like this definitely makes me more eager for the next chance I get to see the scenic mountain ranges and the natural beauty of it all.